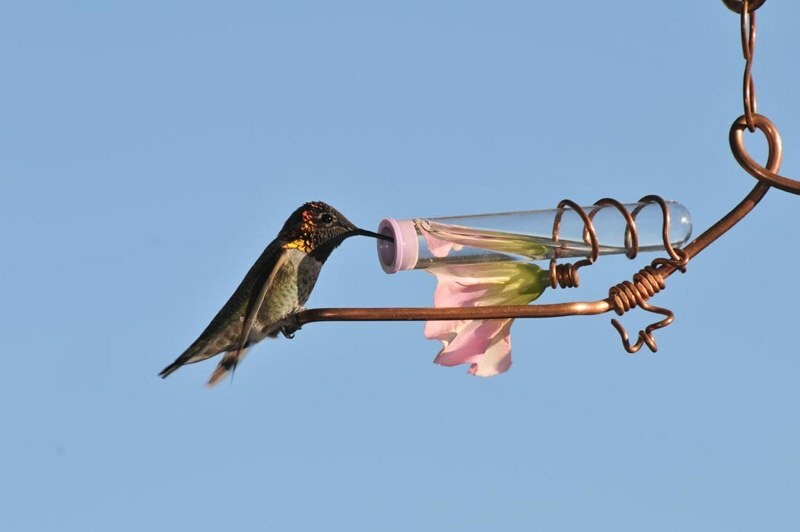 To prepare the safest and purest hummingbird nectar, mix 3 parts water with 1 part white table sugar. Place 1 cup of water in microwave for 3 minutes or until water boils. Then add 1/3 cup of sugar. Stir until it dissolves. Then cool. Please do not use red dye in your nectar. No. 40 red dye is no longer made from vegetables. It is based on the residue of coal tar. That is the same ingredient used to color farm diesel and kerosene. What does that do to our hummingbird? Several things, but the main thing is when a mother bird has been on a diet of red dye; when she goes to lay her eggs, the eggs have a thin line of red under the shell, weakening the shell. When the mother bird goes to lay on her eggs, they crack. We are losing the next generation of hummingbirds!